On December 7th the U.S. Department of State announced that formal negotiations with Canada over the fate of the fifty-three year old U.S.-Canada Columbia River Treaty will begin in early 2018. A broad coalition of conservation, fishing and religious organizations representing hundreds of thousands of Pacific Northwest residents, hailed the announcement. “Conservation and fishing groups are encouraged that the two countries are moving forward with Treaty negotiations. Modernizing the Treaty to improve the health of the river and communities on both sides of the border is not just an opportunity, but also a critical need given the challenges salmon face in the 21st century,” said Samantha (Sam) Mace of the Save Our wild Salmon Coalition. The Columbia River Treaty was originally ratified in 1964 to reduce the risk of floods in downstream cities like Portland, Oregon and to develop additional hydropower capacity. The Treaty accomplished these goals through the construction of three large storage reservoirs in British Columbia (Duncan, Mica and Keenleyside), which added 15.5 million acre-feet of storage capacity. Canada built Mica Dam larger than the Treaty required, adding another 5 million acre feet of non-Treaty storage for power production. The Treaty also spurred the construction of Libby Dam in Montana, which added an additional 5 million acre feet flood storage space and hydropower capacity. All told, these projects doubled the storage capacity of the basin – and dramatically reduced the river’s natural spring flows. Notably, consideration of the health of the Columbia River and its fish and wildlife populations were not included in the original Treaty. Not only did the construction of the dams result in the displacement of people, economies and cultures as a result of permanently flooded lands, it had a profound effect on salmon and other fish and wildlife species – and the communities that rely on them – on both sides of the border. While the Treaty has no formal end date, provisions that govern joint flood risk management operations are set to expire in 2024, which would have major ramifications for how reservoirs in the U.S. part of the basin are managed. Additionally, U.S.-based utilities are keen to reduce the amount of power they deliver to Canada each year as required by the Treaty. Conservation, fishing and faith organizations, on the other hand, view the pending negotiations as an opportunity to include “ecosystem-based function” – or health of the river – as a formal component of a modernized Treaty, on equal footing with flood risk management and hydropower production. Including ecosystem-based function would mean improved river flows to aid salmon’s out-migration to the ocean and improve water quality. It would also mean improved fish passage and reintroduction of salmon and steelhead into areas made inaccessible to salmon by dams in the U.S. and Canada. Treaty modernization also creates an opportunity to improve the governance of the Treaty to allow a more transparent and inclusive process for negotiations and implementation. The United States and Canada will begin negotiations to modernize the landmark Columbia River Treaty regime in early 2018. Certain provisions of the Treaty—a model of transboundary natural resource cooperation since 1964—are set to expire in 2024. 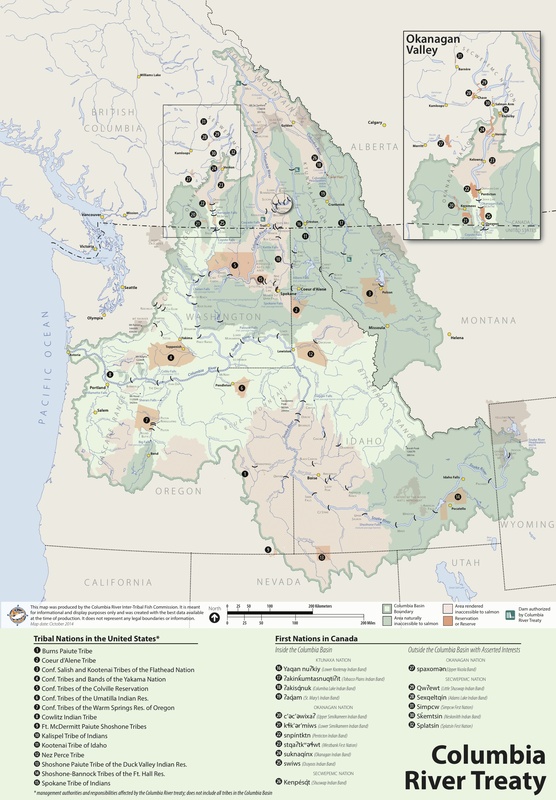 The Columbia River’s drainage basin is roughly the size of France and includes parts of Washington, Oregon, Idaho, Montana, Utah, Wyoming, and British Columbia. The Treaty’s flood risk and hydropower operations provide substantial benefits to millions of people on both sides of the border. The Treaty has also facilitated additional benefits such as supporting the river’s ecosystem, irrigation, municipal water use, industrial use, navigation, and recreation. For further information, please email WHAPress@state.gov.